Old glass bottles. It’s getting really hard to find the REALLY old grubby and cloudy glass bottles anymore; so I’ve had to settle for these, and altering them. The really old OLD bottles sell well ‘as found’. These are actually leftover household containers that I will probably alter. LOVE this tall asymmetrical heart shaped bottle. 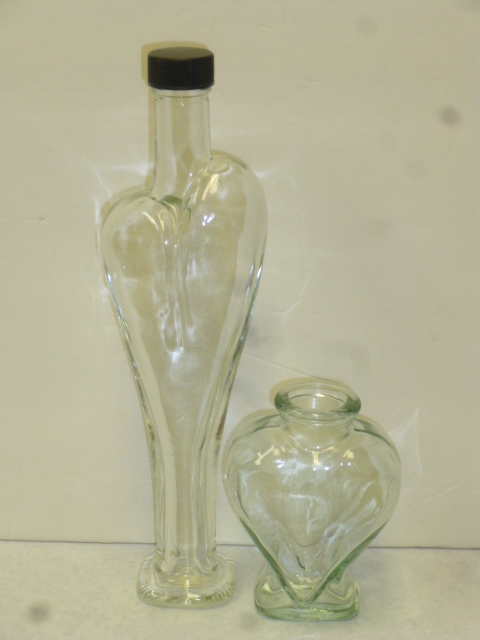 Will be a perfect ‘Love Potion’ bottle for Valentine’s Day decor. 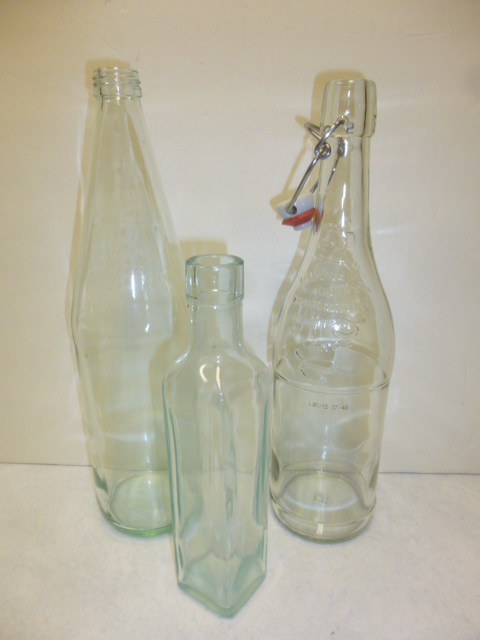 The smaller heart bottles are abundant in thrift stores and can be bought at craft stores. I’m guessing they get used a lot for wedding reception decorations. I’ve used them for ‘love potion’ and bottles of ‘bliss’ in the past, but the bigger or unique shaped bottles always sell better for me. 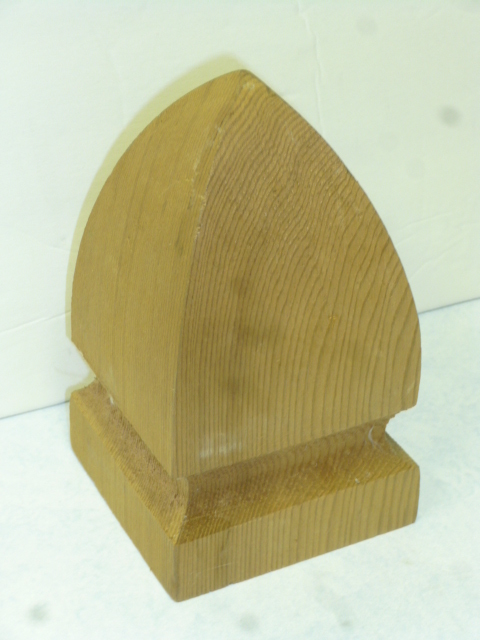 The one of the right is slightly old; has a concave back side and convex front. 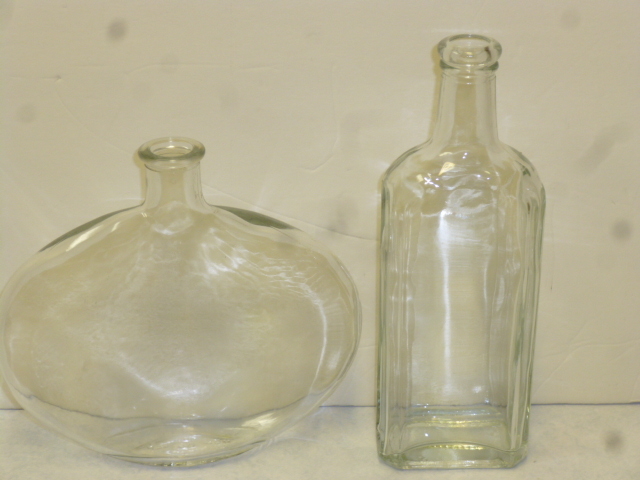 These might be good ‘love potion’ bottles too. I really want to make some BLINGED OUT bottles like these, but I just don’t have the bling! And I really don’t NEED to start collecting more craft supplies. (and Michael says “AMEN” to that!) sigh. So I’ll put this idea on my ‘later on’ list; along with a paper die cut machine. Because eventually my bad back is going to get worse and limit what I can do even more and I’ll NEED more sedentary crafts to work on. LOVE!!!!! 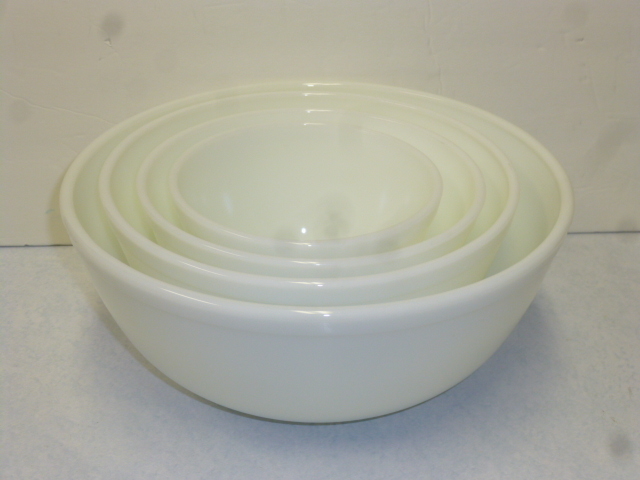 Found this PERFECT set of four milk glass bowls at an estate sale last week, and I am keeping these beauties all to myself! They look just like the vintage multi-colored sets of Pyrex bowls that you see all the time with the colors all faded. I have never seen an all white set. No marking at all on the bottoms of these, not even a number; so they probably aren’t a ‘valuable’ collectible. Rather just good old mixing and serving bowls. 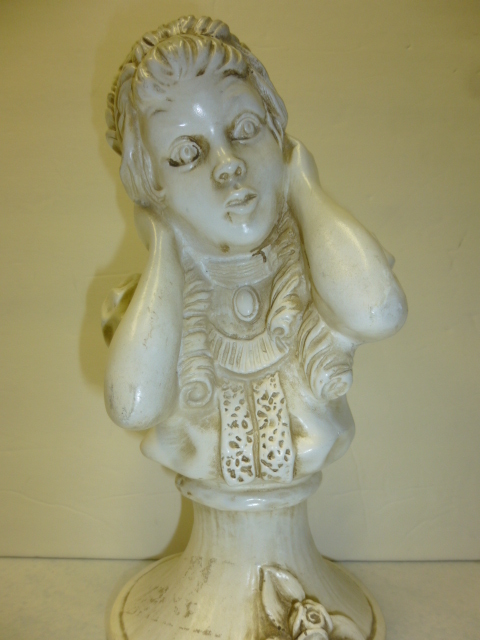 Vintage girl bust. Half of a set; the other is a boy playing some kind of a horn. Hence the girl covering her ears. I’ll give her a fresh coat of white paint and sell her in one of my booths. I am keeping these for myself too! 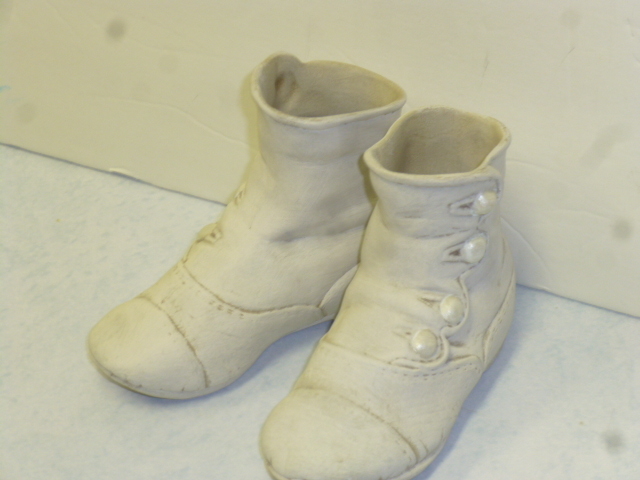 It’s very rare that I find an actual PAIR of fake vintage little shoes like this. (and I love little shoes, but only ‘collect’ little saddle shoes; so far!) 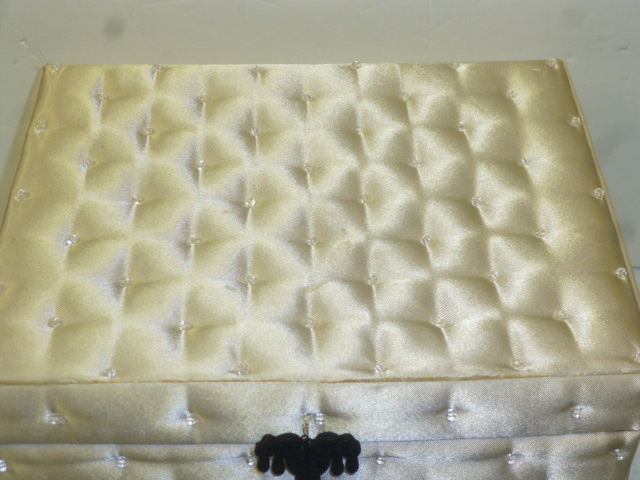 And usually they are the more recently made RESIN factory made kind. (and for some reason crazy expensive for ONE shoe!?!) These are ceramic; possibly even unglazed porcelain. Mine all mine!! 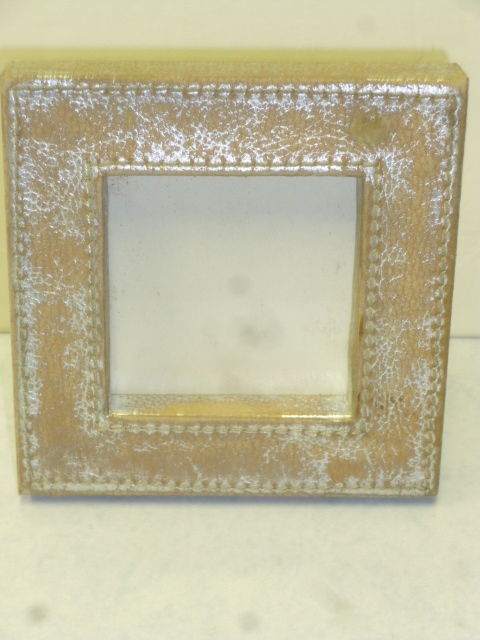 Cute little frame to add a collage to. I’ve already added a small square plaque to the bottom. 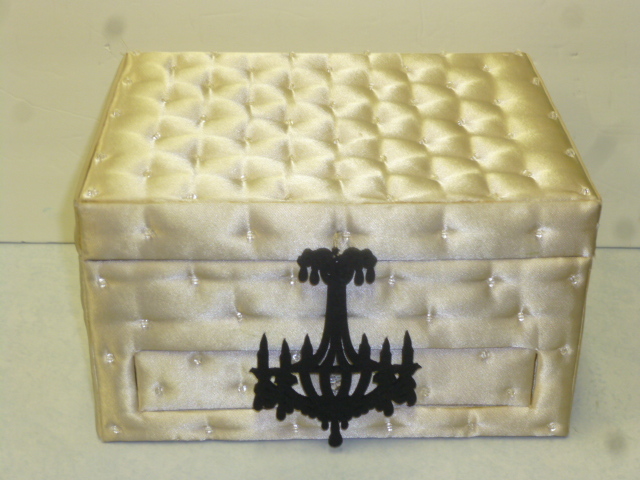 Will paint and distress it; then sell it. I’ve been working on a lot of Valentine stuff so I had ‘red on my mind’ and scored some great red stuff at the thrift store. 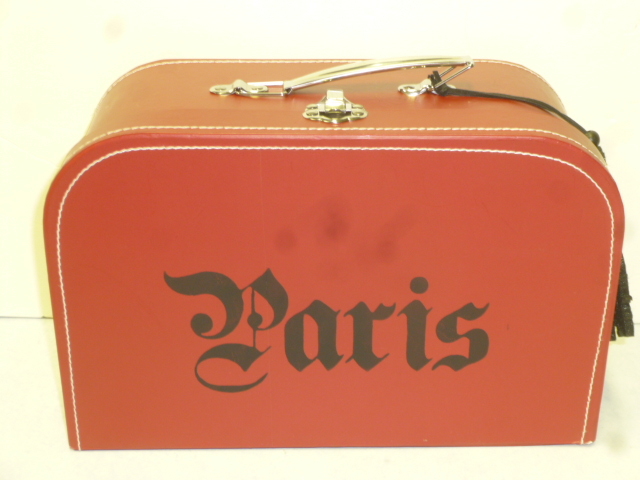 this little suitcase (about lunch box size) had several Disney stickers on it. I tested the corner of one to see how easily they’d come off without damaging the paint; and it came right up. Unfortunately they didn’t come ALL the way off once I got it home. I peeled off as much as I could by hand. Then scraped off as much more as I could with my fingernails. Then the last bit of sticky residue I ‘soaked off’ by laying a damp sponge on over the residue and letting it sit for a while. After that it came right off. But IF that had not worked; the next step in my bag of tricks would have been to try Goof-off. 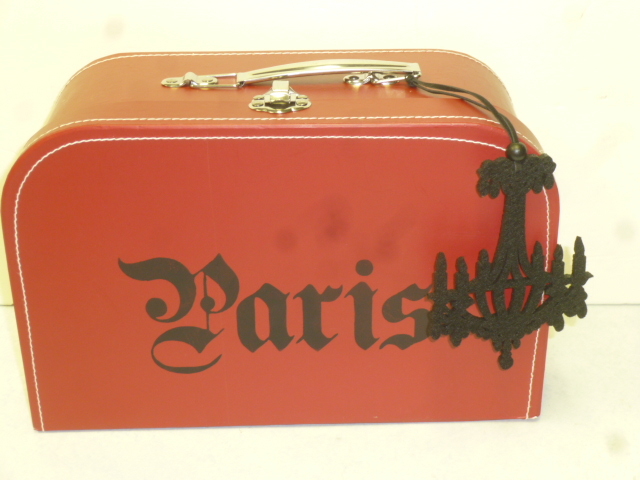 Once all cleaned up and dry, I stenciled “PARIS” to the front and tied on a black felt chandelier tag. This has gone to my booth at Stars. 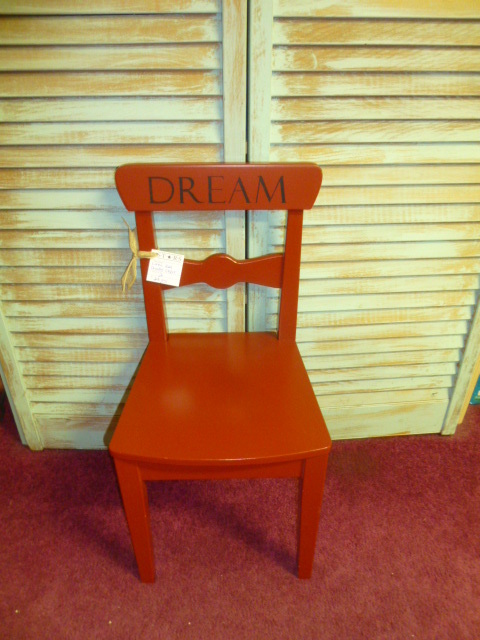 After I found that little red suitcase I found this red doll size chair. Then I found this child size red chair!! woo~hoo!! 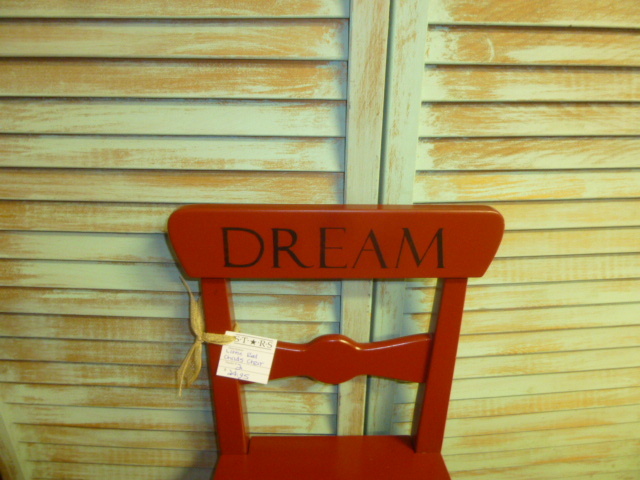 I stenciled the word ‘DREAM’ on the back of the chair. 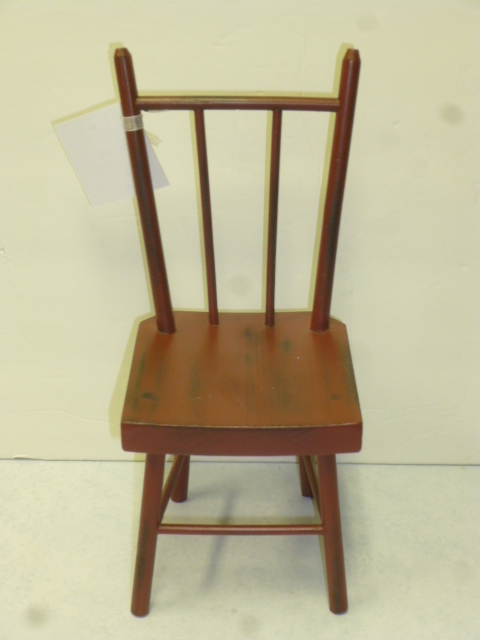 Since the chair had a slightly shiny finish to it; I first painted a coat of matte varnish on the chair where I wanted to put the stencil. Once dry I stenciled. Then a top coat of varnish after stencil paint dried. Had I not ‘prepped’ it with that matte varnish, it’s likely that my letters would have smeared when I varnished over them. Both of the red chairs have gone to Stars. Beautiful cut crystal cake stand. 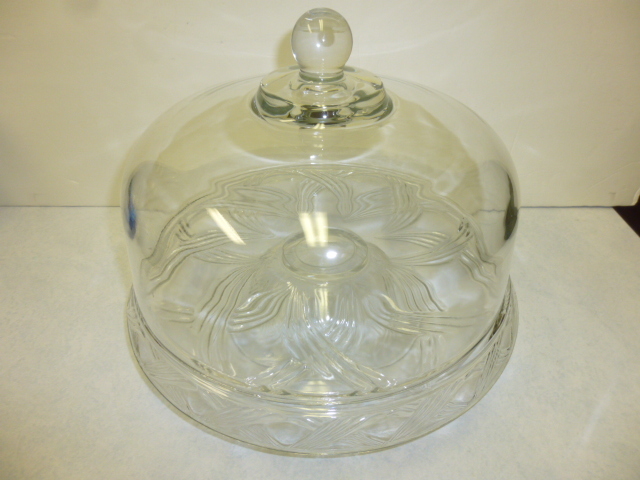 I will always buy vintage cake stands if they have their covers and no cracks or chips. Much like the nice picnic baskets, they have been abundant of late. I didn’t really NEED another one in my booth right now; but they always sell. 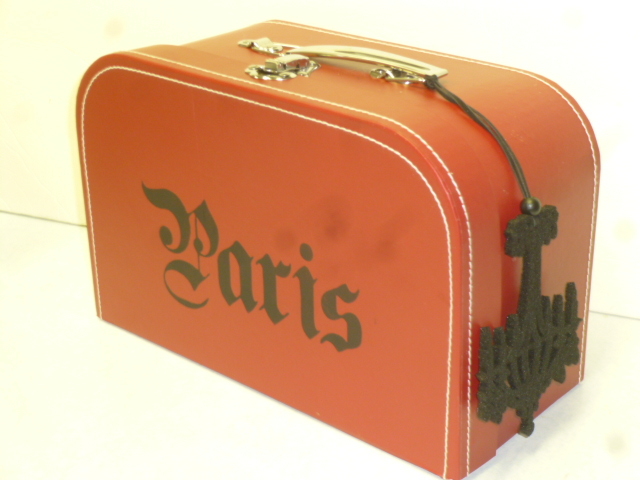 (and it’s fun to create little vignettes on them!) This one has gone to Stars. 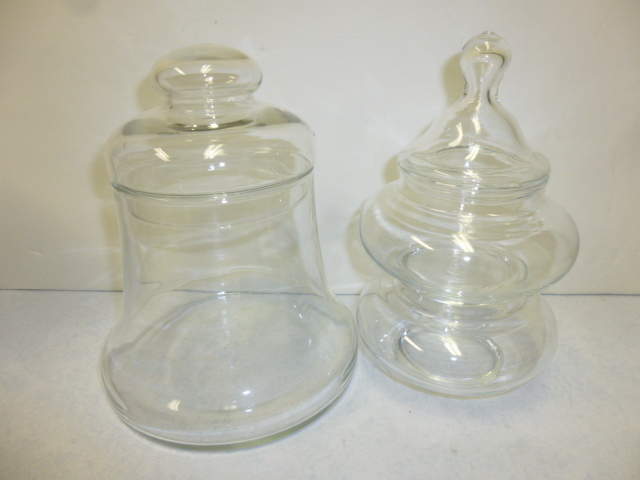 Some jars to alter or fill with stuff. 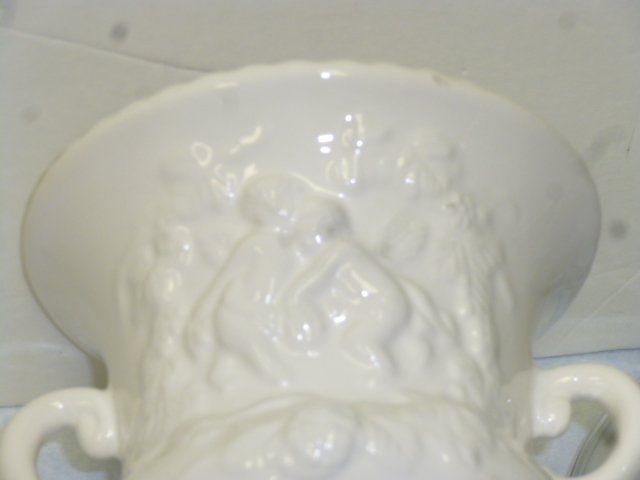 Shabby white urn with cherubs on it. Stuff with cherubs and urns always sell well . Oftentimes I’ll ‘add stuff’ to them. A little nest with eggs. 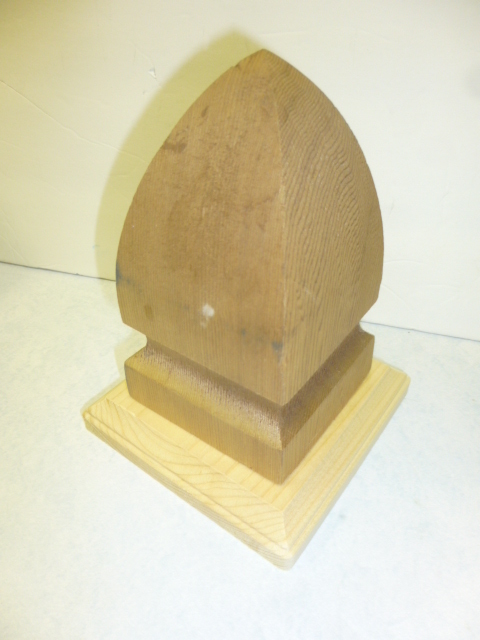 Or use it as a base for a cake stand by gluing on a white plate. 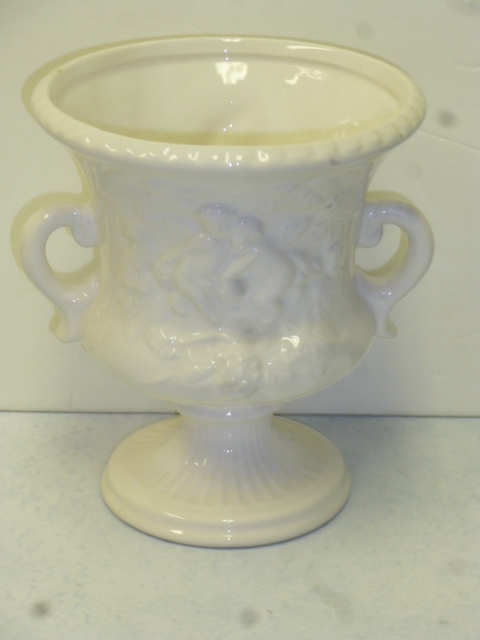 This one will be going to Curiosities, to join the existing display of white vases I have going there. 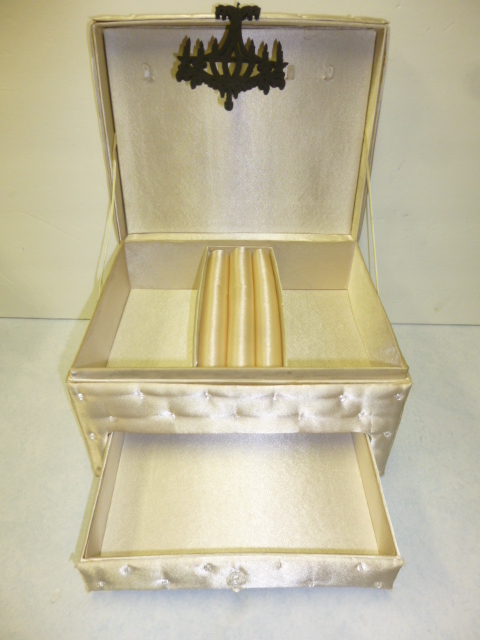 Vintage beaded satin jewelry box is in really good condition. There is a barely visible ‘water mark’ on the top. Insides are in perfect shape. The knob to lift the top was missing; but you could still easily open it without the knob. But I was afraid to cut off the strings left behind; that it might leave a hole in the fabric; so I tied on the felt chandelier tag. This has also gone to my booth at Stars. I was walking through the antique mall where we have some booths today and saw a set of the little girl and boy busts. I remembered having just seen them on your blog. The dealer had them priced at $30 for the pair, if that is of any interest to you.